After a tremendous break it’s time for those of us that haven’t been out on our bikes to get out again!! Tomorrow The Cog Cafe in Tring is hosting a mini sportive with a 25 and 50 mile route available starting from there at 0930. We are proposing to support this local cafe and join their ride of your choice meeting at the Rose and Crown at 0830. On the Fourth Day of Christmas, the Tea Ride called to me…. 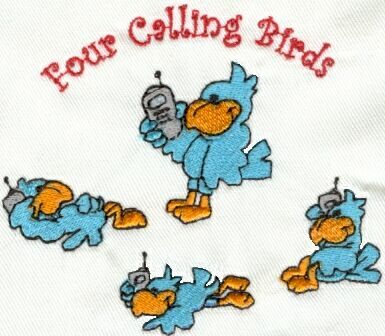 Four Calling Birds will be summoning you to the last Tea Ride of 2013. If you haven’t been out on 2 wheels in 2013, it’s never too late to start – or just start early on that New Year’s Resolution. The Tea Ride… making exercise fun, addling your brain with local & international trivia and giving you a great excuse to eat cake. Like you needed one. So have you all been good…..?? So another year is nearly over and what will he be bringing you all? New bikes a plenty I hear you say! 29 Miles or a slightly shorter 22 miles for those that don’t want to go quite so far! Something for everyone!! (Hats and Tinsel optional!). Dave B thank you for the rides, look out for next weeks teaser from the Beezer! Too much Turkey and pudding? Need some fresh air? Family at war? Whatever the reason why not join us on Boxing Day for a leisurely walk to Ashridge for coffee and Sloe Gin (bring your best vintage for sampling!). We aim to leave the Rose and Crown at 1000 and return there for around 1300. All welcome, dogs too! As the nights and weather draw in our thoughts move towards our Turbo Trainers. We are looking at planning an evening or 2 of Turbo Thrills in the Ivinghoe/Pitstone/Slapton area. All you need is a bike and a Turbo Trainer! To gauge interest please could you add a comment to this post indicating your preference of day of the week. This is not only a great chance to maintain your fitness but also to help Hegs back to fitness! Thank you to Jayne for organising the Christmas Dinner which was enjoyed by many! Pedalling in our winter wonderland. Cycling in our winter wonderland. We’ll say: Are you with us? Of cycling in our winter wonderland. Cycling in a winter wonderland. Just getting you into the mood for The Tinsel Ride – this Saturday, leaving the Rose & Crown at 10am. Christmas hats, decorated bikes, tinsel, baubles – the choice is yours! Oh.. and bring your singing voices too – you never know where the Tea Ride will take you…..
so says Dave Bembridge who has designed the Sunday route that we will have the pleasure of riding this week. We are once again exploring new lanes as we venture to Great Missenden and back. As usual, we meet outside the Rose and Crown from 9:45am and will be departing at 10am. Meet at the Rose and Crown at 10am for a sociable bike ride out for tea and back again. 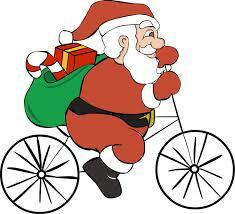 Hopefully see some of you at the Rose and Crown tonight for the Velos Xmas meal, 7pm for 7:30. A Christmas Present from one of our Sponsors! Mountain Mania and The Roadroom Tring, Club Night Wednesday 18th December – 20% off everything! We are pleased to announce that on Wednesday 18th December they will be holding a Club night at both The RoadRoom and Mountain Mania Cycles in Tring. They will be offering 20% off everything in both shops for one evening only, that’s Bikes, Clothing, Food, Parts, Everything! They will be open 19:00 – 21:00 for Club members, simply tell them you are proud to ride with Vinghoe Velos to help them apply the discount at the till. 20% discount does not apply to anything already discounted, sorry! Are you going to the Velo Christmas meal on Friday 13th December? If you are NOT on the following list of names then you need to let the Rose and Crown know your meal choices as soon as possible. The Christmas menu can be found at…. You can email your choices to info@roseandcrownivinghoe.com or call the pub on 01296 668472. This is urgent – take action now! This week’s ride has been kindly mapped out by Andy Beezer. The route takes us to Markyate and back via some interesting lanes whilst covering just under 35 miles in the process. We meet at the Rose and Crown from 9:45am with a planned departure time of 10am. Can anyone who hasn’t made their meal choices yet make sure they do by tomorrow (Sunday) lunchtime please? It’s a hard task as it means going into the Rose and Crown- could be combined with a drink? If you can’t make it to the pub this weekend, the menu is on the pub website so you can give them a ring and let them have your choices. Also if you want to go but haven’t yet paid a deposit, there may be room for one or two more if you get in quickly. Hope to see lots of you there.